You’d have thought that getting a dog’s abuse from fans, managers, pundits and the presses was part and parcel of being a football ref nowadays. It seems that the average ref can’t fart nowadays without having some fan or player berating him. It’s difficult to not have some sympathy for Hamish McWhistleblower, not only are you forced to watch some of the worst football in Europe (and pay attention), you’ve also got to put with the likes of Neil Lennon, everyone’s favourite ginger mental case, screaming abuse at you as well. 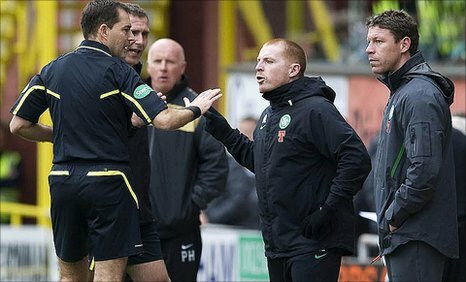 No doubt about it, the lot of the Scottish referee is an intolerably poor one. Throw in some lunatic religious conspiracy theories, rampant nationalism and a McCains factory full of chips for the average fan’s shoulder, and you get an idea as to how unpleasant Scottish football actually is. No, scratch that, because that actually applies to Scotland as a whole, not just the footballing parts (I’ve seen “Trainspotting,” I know what it’s like up there). On a serious note though, it’s worth thinking about and I suppose we are forced to ask the question why this hasn’t happened sooner. I’ve always been of the opinion that refs need to stand up for themselves and although I’m generally not in favour of strike action per se, I would support it in this instance. While various football leagues throughout Europe have been quick to trumpet the “respect” agenda, there seems to be precious little of that available to our officials. It seems that you can’t watch an episode of “MOTD” without seeing some poor sap being accosted by a 6 foot scouser the size of a wardrobe screaming abuse at him, inches from his face. Respect, of course, is a two way street. I’m under no illusions that refs need to up their games a bit. How would they do this? Again, it’s difficult, refereeing is about making big decisions on the spot, without the benefit of video replay. Until FIFA approve the use of video replays, I’m afraid we’re going to see this kind of industrial action more often. Rest assured, that isn’t a good thing, even in Scotland. Perhaps it was because I’ve barely seen Celtic this season as most of my weekends are spent commentating. Perhaps the league table caught me off-guard, with 8 wins from 8 games. Perhaps it was sleep deprivation, combined with a portable flux capacitor and I thought I was about to watch the 2001 team. (OK, maybe not that last one.) Whatever it was, I woke up on Sunday certain we were going to witness a performance from Celtic, and that Lennon’s side would go a long way towards healing the pain of last year. What we got was more of the same. I’ve seen a few accounts post-match, many of them hysterically blaming Willie Collum for his ridiculous penalty decision. Sure, he got that one wrong, and yes, it was a sore one to take. At 2-1 the game was wide open, but at 3-1 we needed a miracle. However, that doesn’t quite tell the whole tale. I’m very unhappy to say this, but if I remove my green-tinted specs I will begrudgingly admit that Rangers dominated the game, and we got exactly what we deserved. Tactically, Lennon got it wrong, but he was let down by his experienced players all over the park. And it simply wasn’t good enough. Let’s look at Lennon first. The system he picked was a head scratcher for me. Going for 4-4-2, but with Maloney and Stokes as the wide men meant we were effectively playing 4-2-4. Against a side with a 5 man midfield, we were always going to get over-run. We did. Now there are some who may say that the system was changed early on with the Maloney injury. They’d be right, but the problem there was we still had both Samaras and Stokes playing wide. Both out-and-out strikers, neither were going to be useful in the midfield battle. Indeed, we were lucky not to lose Stokes just a couple of minutes in for a horrific challenge. Then of course we persevered with Glenn Loovens at the back, and if he’s actually a professional footballer then I’m a Dutchman. I think Lennon should have predicted the inevitable Rangers formation and looked to play with 3 central midfielders, with Ki and Juarez playing in front of the back 4, and Ledley as a ‘box-to-box’ player. At Cardiff, Ledley was renowned for getting ahead of the front men and scoring goals. The type of player we have been missing since Stan Petrov left for Aston Villa, yet I believe we are not seeing the best of him thanks to our system. He almost reminds me of Paul Hartley: a player we signed as a great attacking midfielder, yet we played him as an anchorman. Too early to tell with Ledley, but speaking as someone who watches a lot of the Championship, I thought he was wasted protecting the back four. And now, onto Samaras. People who have ever read my posts before will know that I’m hardly the big Greek’s biggest fan. He leaves me tearing my hair out at just how frustrating he is. I just don’t know how he can be so brilliant one week, and the next he’d struggle to get a game for Lincoln City. On Sunday he was just simply abysmal. So much time was spent screaming at him. He dallied on the ball, didn’t see simple passes, and his ball retention was non-existent. There was a little drama involving Lee McCulloch in the first half, with the Rangers man lucky not be shown a second yellow. However, if Samaras had been on his game he would have slid Hooper in before McCulloch had a chance to make the challenge, got himself into the box and we may well have scored. And there were countless times he did this. Rather than taking a simple pass to slide the full back in for a cross, he tried to cut inside, or just took too long and the momentum was gone. Then onto our defence. The first goal was an absolute shocker to concede, especially so early into the second half. All the momentum we had gained from Hooper’s goal right on half time had gone, and it was simply because we didn’t have the nous to deal with a high, hopeful cross into the area. Can you imagine that cross coming in with big Bobo back there? Or even Mjallby? (I’d suggest registering big Johan as a player again, just so we can have SOMEBODY who’ll put their body on the line at the back.) Quite simply, that kind of cross should be dealt with by Loovens and Majstorovic all day long. And if the first goal wasn’t bad enough, the second was a real howler. I’m a firm believer in only passing the ball back to the keeper when you absolutely have to, as all they ever tend to do is boot the ball upfield. Majstorovic didn’t have to, he had time to clear the ball himself. Instead, he caused unnecessary pressure by knocking the ball back to Forster, and we all know what followed. Such a poor goal to concede, and it really knocked the stuffing out of us, and Rangers just got stronger. I’m not going to go into the penalty decision, because it has been done to death, but we were never going to come back after it. All in all, it is more fuel to those who say that Lennon is yet to win a match “that matters”. At the moment, it’s hard to argue with them. Ross County, Braga, Utrecht and now Rangers really do take the shine off his previously unblemished league record. Fortunately, it’s a cup-tie on Wednesday and an immediate opportunity to put that right. I’d suggest that we will. I’d also suggest that the next time we come up against Rangers we’ll be much more balanced as a side. Lennon strikes me as the sort of manager who’ll learn from tactical errors, unlike his predecessor who blindly stuck with the same players and system, even when it was blatantly failing. And despite all my negativity throughout this post, it is just three points. By the time the next derby comes around, our newer players will be even more settled, and with more experience of what it actually means to play for Celtic. This championship is a long way from being over, and we’re right in the hunt. Keep the faith, Bhoys and Ghirls. There’s a long way to go yet. My apologies for the delayed blog, once again I’ve spent my weekend commentating (and I will be commentating again on the Cruz Azul v Tigres match tonight, too) so I have not had an opportunity to dissect Thursday night’s atrocity. Before I start, I’m sure some of you didn’t get to see the game thanks to it not being available on TV, so here is the YouTube highlights clip. So what can I say that hasn’t been said before? Truth be told, not much at all. It was a woefully inept performance, and the great promise from the previous week’s comfortable victory had disappeared after 20 minutes. I don’t know about you, but after the second penalty had been given, I knew that only one side were going through. The second penalty was even worse. There’s an infamous saying when learning the game of football of “if in doubt, kick it out”. I’m not sure what the Polish, or indeed, the Korean version of that saying is, but I’d suggest that Lenny looks it up pronto. Both Zaluska and Cha had an opportunity to put the ball out of play for a throw in, yet instead they manage to give the ball away and a silly penalty is the result. Then after the second half kicks off, Lennon’s words surely ringing in the players’ ears, and the phrase “keep it tight” was surely that very message, we concede another ridiculous goal. Why could none of our defenders get a challenge in, or at the very least bring the winger down on the half-way line before he can get to the edge of our box? OK it’s cynical, but why not? Italian sides have done it since the dawn of time. At 3-0 the game is done, and the fourth doesn’t even need talking about. So we have no European adventure, either in the cash-rich Champions League or the consolation prize of the Europa League. Now I’ve heard many fans try and be bullish about this, claiming that our defeats will make us stronger over the course of the season, and that without the distraction of European football the squad will become more focused on the league title. What utter tripe. The effect of this defeat will not be felt this season, but next, and the year after that. No, I’m not talking about the financial side of the defeat, but about the club’s reputation around Europe. Celtic is still a massive name, but that only gets you so far. Players of quality will not sign unless they feel the move can benefit their career, sometimes financially, but also on the field. Will a move to Celtic right now help anybody’s international prospects? Of course not, you’d be better off in the English Championship. The lack of European football this season will make players think not just twice, but three times or more about a move to Parkhead. Why move to a club that cannot give you that platform of Europe to play on? We also need to move the time of the season. One of the reasons so many clubs struggle in these early preliminary rounds is because they are still rusty from pre-season. Clubs in Scandanavia and Russia start their seasons early because of the weather, but if the Scottish season began in May then late June or early July European games would see all of our clubs in full swing of the domestic campaign, and as such, rustiness is no longer an issue. Sure, there are possible problems to this (the transfer window for one, and the possibility of a 12 month season if one of our clubs is lucky enough to make a European final again, and of course, the World Cup) but it has to be worth investigating, especially now there is only one Champions League spot up for grabs, and it could take THREE qualifying rounds. This can hopefully lead to a couple of sides sneaking into the European arena again. This in turn will see a return of prestige, and more importantly, cash to the Scottish game. This really isn’t a new idea, and that I accept, but without urgent changes the Scottish league will become as prestigious of that in Wales. Dark days then for the game north of the border, and it’s time for fans to make their voices heard. A complete revolution is the only answer. OK, it’s official: I’m almost gibbering in excitement ahead of the new season. There’s nothing like opening day optimism for every fan of every club, but at Celtic there’s more reason for that than most. The fans have been keen for quality signings after the atrocity of last year, and I’m quite hopeful that Lenny has delivered. Joe Ledley was a terrific piece of business, a player who is very highly rated and rightfully so. He’ll certainly add a new dimension to the midfield, and him and Brown have bags of potential. I’m also really pleased with the Juarez signing, a player who looks like he will add a bit of steel to a midfield too often bullied under Mowbray. However, the purchase that has really caught my eye is Gary Hooper, the 22-year-old striker from Scunthorpe. OK, there will be doubters. The more ignorant will say ‘who are Scunthorpe?’ and dismiss him before he even arrives. I imagine in days gone bye, a section of the Liverpool support said ‘who are Chester?’ when a certain Mr Rush was signed up, too. Others will ask why the club have brought in a player with no European experience, and whilst they may have a point, I think only the most optimistic of Celtic fans is concerned with the European adventure this year. Getting beyond Braga is difficult enough, and then we would face the likes of Tottenham, Sevilla or Sampdoria for a chance to make the Champions League itself. OK, participation in the Europa League is a likely bet, but surely that’s a perfect opportunity for Hooper to get that experience he is missing, no? Instead, our priority has to be wrestling the championship back from Ibrox, and for that, Hooper is our man. I’m not one to kick the quality of the SPL while it is down, but we have to face facts, so I would argue two-thirds of the SPL is equivalent to the English Championship in terms of quality, with the other third similar to League One. At that kind of level, Hooper scored 50 goals in 93 games for Scunthorpe United, which suggests to me that if he plays he’ll set the SPL alight. Indeed, I think it is a monumental piece of business from the club, and being only 22, he is also one for the future. As for Daryl Murphy, I’m afraid I need to reserve judgement. He looks like a reasonable target man, but it seems a bit ‘Chris Killen’ to me. I hope somebody points that line out to me at the end of the season after he has scored 20 goals, and I’ll happily eat some humble pie, but we’ll see. Saying that, with him signing I’d expect to see him starting the season off in the team. As always though, when new players come in some have to leave. Hooper will be the eighth striker at Celtic Park (if you consider Maloney to be just a winger) and that figure surely needs cutting. I’d be surprised to see either Fortune or Rasmussen leave as they are new arrivals, but numbers do need to be cut. McGowan has recently signed a new contract, so I’d suggest he was safe, but that leaves Sheridan (a certainty to leave) Samaras and Hutchinson. I won’t pretend to be disappointed when Samaras leaves (the most frustrating player I have ever seen, some days brilliant, but others he’s horrendous. The phrase ‘sublime to the ridiculous’ could have been coined for him alone) but I am disappointed Hutchinson hasn’t really had a chance at Celtic. I’m also eagerly waiting for some new defensive signings. I think there is promise in Rogne and Hooiveld, as there is in Thompson, but I’m yet to be convinced by Loovens and O’Dea. I’d hope all the money earned from the inevitable McGeady sale is pumped into the defence, with two commanding central defenders the top of the list. And of course, David James too would be a welcome addition as a short-term replacement for Boruc. So how do we line up opening day? Truth be told, I haven’t got a clue. I can’t even put my finger on a formation, let alone a first XI, so all I can do is pick my own. For me, it has to be 4-3-3 to utilise the talent at our disposal, with the central striker as a target man, Fortune out wide right and the third striker as a ‘poacher’, so here goes. Been a while since I got to post about Celtic, so I’ll make the most of the Ledley signing today. Seems like Lennon is looking at some tidy players, and Ledley is a bit of a coup for him personally. Ledley has been linked with numerous clubs the past few months, so for him to choose Celtic really is fantastic news. I’m quite pleased with the signing of Mulgrew too, especially for his dead-ball skills. Since first Nakamura and then Robson left, a dead-ball specialist has been a necessity for us to bring in, and the fact he plays in one of our weaker areas is also good news. However, as far as both Bullard and Campbell go, enough is enough. Both have had several weeks to make up their mind, and now they are both just toying with the club and the fans. If these players consider Celtic to be a ‘last resort’ then we shouldn’t be after them, especially not with the squad that Lennon has inherited. Heart and desire was sadly lacking in Mowbray’s team, but if a player cannot even decide if he wants to play for the club in a four-week period, who is to say he can be depended upon to pull the club out when we’re in a hole? Quite frankly, I wouldn’t want to rely on them on a cold Wednesday night at St Johnstone, let alone the white-hot atmosphere of the Old Firm derby. Instead, Celtic need players who believe wearing the Hooped shirt is a privilege, players who will fight for the cause, players who the fans will love as much for their spirit as for their skills. This is something Mowbray clearly didn’t understand, but I don’t see Lennon having the same problem. Time to move on to other targets. Finally, I’d just like to thank Artur Boruc for his five seasons at the club, and wish him all the best in Florence with his move to Fiorentina. You’ll always be welcome back at Paradise. However, the ‘Holy Goalie’s’ move will at least allow us to see the best of Lukasz Zaluska. Next stop, another striker and a central defender. Roll on the new season. Deja vu for me as Sol Campbell linked to my club…just the other one! OK, there’s a glitch in the matrix. Around this time last year, I was positively giggling in excitement at the prospect of Sol Campbell pulling on the Black and White shirt and running out for Notts. Now after that abysmal episode, and via former club Arsenal, it appears that Campbell is set to become an important part of my footballing life after all. So how do I feel about Campbell at Paradise? Actually, providing he isn’t on a Bobo Balde style contract I’m quite happy. The club has been really struggling defensively, and has lacked a true commanding centre-half for a couple of seasons. Even at 35, Campbell still showed himself to be capable in the Premiership playing for Arsenal, so I see no reason why he couldn’t continue that at Celtic. Look at our current list of central defenders and the one thing that is missing is experience. The two youngsters Thompson and Rogne have looked pretty decent, and with an experienced player like Campbell alongside them they will certainly develop quicker. After two seasons I’ve come to the opinion that Glenn Loovens isn’t any better than Gary Caldwell or Stephen McManus, and quite frankly that’s not good enough. I’m happy to give Hooiveld more time, but I think Loovens should be shown the door by the new manager. But then we have to wonder who else is available. Lennon has publicly stated that he wants to bring Keane to the club on a permanent basis, but I honestly think that is simply a pipedream. Indeed, if that was going to happen he’d have been signed whilst still at Celtic Park, so I just don’t see it. Keane has been linked to both Aston Villa and Everton, and I think it is clear to see that we cannot match the financial clout of either of those two clubs. However, I do see another 30 year old striker in the Premiership who isn’t getting a game, and could perhaps be tempted north. He has struggled with injury this year, and has been overlooked by his country for the World Cup. He’s also one of the top scorers in Premiership history. Guessed who it is yet? Michael Owen. Unrealistic? I don’t think so. United will be looking to add to their front line this summer, and after Owen’s injury record they may consider cutting him off their wage bill. I honestly believe he’ll struggle to find a top 10 English club, yet Celtic could bring him in on a season-long loan or a free, and if we can keep him fit he’ll tear the SPL apart. Then there’s also the possibility of European football. One thing is for certain: if we can afford £3.8m for Marc Antoine-Fortune, we can afford Michael Owen’s wages! Mind you, we may have our sights on another striker this summer, with Kris Boyd rumoured to make the move across the city. As much as I’d normally be against it, the amount of comedy us Bhoys will get out of it will make it worthwhile.